It seems so quotidian – the conversation that is – at least as it starts out, in Lucy Kirkwood’s The Children. Having been out of touch for decades, Rose (Francesca Annis) arrives unexpectedly at Hazel (Deborah Findlay) and her husband Robin’s (Ron Cook’s) cottage by the sea. Alone for now, the two women discuss the inevitable – children, grandchildren, aging, and “women looking like stretched eggs – trying to hide it when all it’s doing is shouting it out loud isn’t it, “I’m old and I’m frightened of it!” Hazel insists. For the most part, their conversation is banal, a kind of endless, drawing room banter that prevails, even when the conversation turns to the disaster. Rose asks about it – an apocalypse of sorts. As Hazel describes it, the kitchen was shaking, the road cracked down the middle, the sea looked like boiling milk, and there is talk of radiation hanging in the air. The cottage, too, as designed by Miriam Buether, is tilted from the eroding earth. And there is talk of the terrible smell! While the disaster closely resembles the meltdown of the nuclear power plant in Fukushima, it feels remote. It’s the words that hang in the air here – not the sense of urgency of a nuclear power plant exploding down the road. In fact, it takes a while before we can understand why these people are connecting at all, after all these years. Finally, Deborah’s husband Robin gets home from feeding the cows – in his retirement, he’s taken on the very demanding job of running a farm, he tells Rose. The triangulation that occurs sparks a sense of absurdity, reminiscent of Albee’s Who’s Afraid of Virginia Woolf?, or Pinter’s Old Times. Indeed, their behavior becomes as childish as it is childlike. Rivalry between the two women over Robin leads to lots of acting out – a recurrence from the past. In the midst of it, Robin rides a tricycle around the kitchen, and the three of them dance to the rock ‘n roll of their youth. Clearly now we see that it is the disaster that has brought Rose back to the place where they had all worked and lived, building the nuclear power plant that is now pushing the world to the edge of extinction. Amidst the focused realism of this production, imported from London’s West End, the surreal emerges. Video projections (by Peter Mumford) of tsunami-like waves batter the world outside the cottage. To Kirkwood’s credit, the ending leaves us with nothing much more than our own uncertainty. Will Rose succeed in her mission to shut down the nuclear power plant, at the expense of her own life and theirs, or will they sit back and get killed from the radiation pouring into the environment? Truly it is a quintessential question of our age and as presented here, it’s simply up in the air. Maybe we’ll pull through, but the possibilities appear slim, and the commitment to saving the world hard to muster. 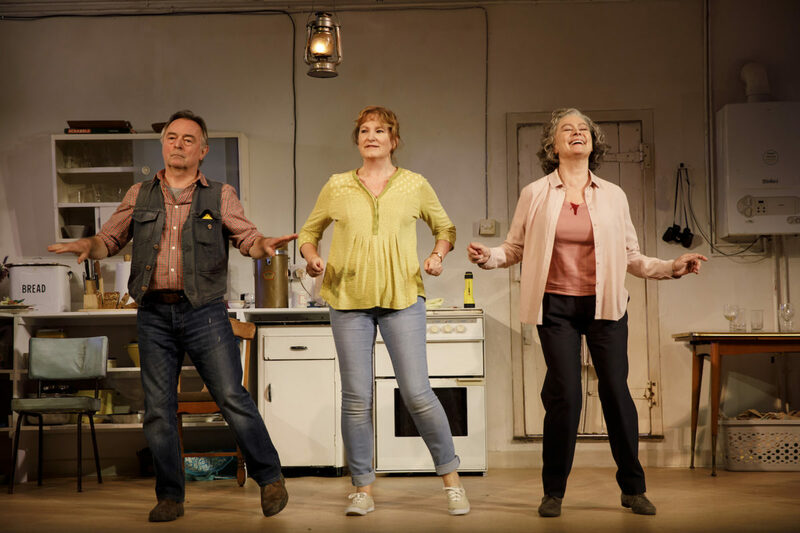 Masterfully directed by James Macdonald – known for his productions of Caryl Churchill’s plays in New York – Macdonald helms a cast of seasoned British actors. 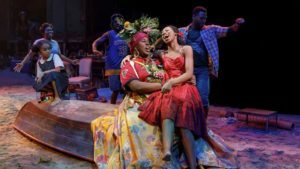 Whether you’ve travelled to a tropical island, or watched the weather reports about Maria, Irma and the other nasty girls rattling these small and unprotected isles, you may find the opening of this musical a little too familiar. Fortunately, it is far from that. But the outcome here transcends the fatalism of those romances. Spirituality of a nearly pagan sort, with the trees and the wind creating the music of the gods, intervenes to save them – each in their own way – that is. 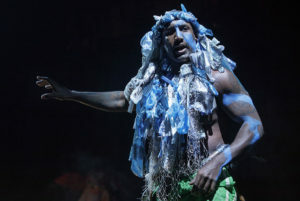 Opening on a catastrophic flood, sand, detritus, a live goat, chicken, people in torn beach wear, and the remnants of homes and sailing vessels, designed by Dane Laffrey, set the stage. A little girl, Ti Moune, (meaning little orphan) “torn from her mother,” survives the onslaught by hiding atop a tree. And she is saved by a loving older couple, who take her in in spite of their poverty. As directed by Michael Arden, the production, speaks to our senses with sound effects of birds and sea, as well as speeding cars and cocktail shatter. Workers sweep the sand off the oriental rug, as the littered beach turns into Daniel’s family’s elegant palace. Similarly, Jules Fisher’s and Peggy Eisenhauer’s lighting brings to life the natural beauty of the tropics, along with the radiance of the cultivated social halls graced by the rich. Similarly, Stephen Flaherty’s melodies capture the enchantment. Making their Broadway debuts, Isaac Powell and Hailey Kilgore create wonderful stage chemistry. Interestingly, the musical, a revival from 1990, is especially timely in its evocation of youthful heroism. Note the current popularity of the film Ladybird, and the success of the Netflix series, Stranger Things. In children we trust.